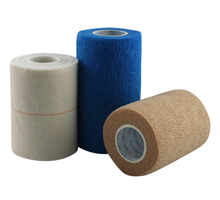 High quality cotton and rayon cloth bandage is co-adhesive, reusable, non-adhesive and self adhering. Allowing greater compression that will not slip or loosen during activity, these bandages will stick to themselves but not skin or hair. Perfect for use by horse/greyhound trainers, veterinarians and cattle farmers to protect their animals.